The Mini Bluetooth Mesh Controllers are offered in single color (15 A per channel), tunable white (7 A per channel), RGB (5 A per channel) and RGBW (2.5 A per RGB and 4 A on White Channel). The devices enable users to create timed scenes using the controller’s internal clock for setting preprogrammed recurring scenes. They are equipped with full-circuit protection and are compatible with constant voltage LEDs from 12V DC to 24V DC. The controllers are compliant to CE and RoHS standards and are suitable for variety of LED lighting applications. November 29, 2018, San Diego, CA – Environmental Lights, a leader in LED lighting solutions, announced the launch of Mini Bluetooth Mesh Controllers. Mini Bluetooth Mesh Controllers enable users to control LED lights from a mobile app. Available in single color, tunable white, RGB and RGBW, the controllers have a wireless range of up to 45 feet in an ideal environment and can be networked together to create up to four separate lighting zones. The Bluetooth mesh network, created by digitally linking multiple controllers, enables users to manage all configured lighting zones when in range of any of the devices. The integration of Bluetooth Mesh technology allows users to create a wide network of multiple connected devices. The devices speak to one another as a unified whole, resulting in more reliable data transmission throughout the network. Using the Light Mesh app, users can create timed scenes using the controller’s internal clock to set preprogrammed recurring scenes based on the time of day and day of week. The Mini Bluetooth Mesh Controllers are equipped with full-circuit protection and feature a compact, ultra-slim design. 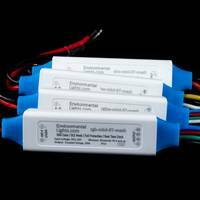 They are compatible with constant voltage LEDs from 12V DC to 24V DC, and their CE marking and RoHS certification makes them safe for use in a variety of LED lighting applications. Mini Bluetooth Mesh Controllers are available exclusively on EnvironmentalLights.com or by calling (888) 880-1880. Environmental Lights was founded in 2006 in San Diego, California, and has been listed on the Inc. 5000 as one of the fastest-growing private companies in America six years in a row. We transform environments with LED lighting technology by engineering our customers’ visions into innovative solutions. We partner with our customers from project inception, through planning, specification and installation of their LED lighting systems to ensure we create solutions that match their exact needs. Our work transforms environments in an array of industries, including retail display, entertainment, trade show/exhibit, hospitality and casino gaming.